I recently traveled south to my parent's winter escape on the Gulf Coast of Florida, and my friends at Folbot sent along a few boats for us to paddle, a 13' Yukon and a more nimble 10' Citibot. Both were paddled extensively by me and my family. A test run to assemble the boats after arriving in Florida. The Adventure: My brother and I set out early the morning after arriving in Florida to explore some creeks North East of my parent's place. We ended up at a small landing on Shell Creek, near the town of Cleveland, FL. We assembled the boats quickly and were on the water as the sun began to make its way over the horizon. Jim scanning for gators on Shell Creek. First light on Shell Creek. We began our paddle with light winds, and the temps in the low 70's. It was a great start. We paddled against an ebb tide, exploring inland towards a dam and a freshwater pond. With Jim in the bigger Yukon, and myself in the Citibot. Jim had plenty of room to stretch out and I found the Citibot to be surprisingly roomy for a 10' kayak, it had plenty of room for all of my photo gear. Exploring one of the many twisty off shoots of Shell Creek. 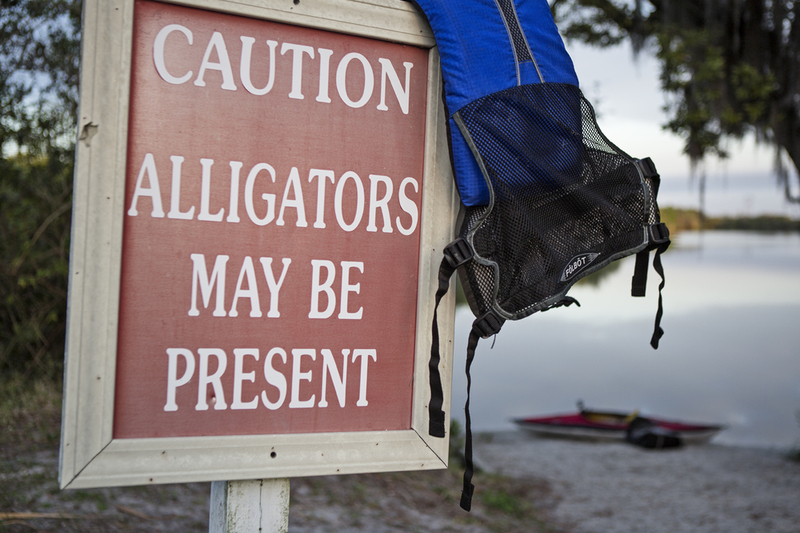 Not only were alligators not present, neither were manatees. We reached the end of Shell Creek after about 2 hours of paddling. The wind had begun to pick up an hour after our launch, but we hadn't noticed it until we began our portage around the dam. A mile of open water lay in front of us, and the wind was blowing steady at 13 mph with gusts up to 17.5 mph. We discussed returning the way we came to avoid the wind altogether, but we still had a lot of exploring left to do, so we decided to press on. Snack time after the small portage. Using the weatherflow wind meter to gauge how miserable this would be. We survived the crossing, with my Citibot being blown around a bit more than the Yukon, as one would expect. We were rewarded with a smaller, fresh water creek (now Myrtle Creek) and small stands of cypress trees. It was nice to be able to get in the shade and out of the sun every once in a while, it was near 80 now and getting warmer. More of a swamp than a creek here. We finished the day at Hathaway park around 1, with 8 miles under our belts. We gave my pop a call to come pick us up and set about disassembling the boats. We had everything packed up when our ride arrived, so we tossed the bags in the bed of the truck and headed home to enjoy the sunshine by the swimming pool. 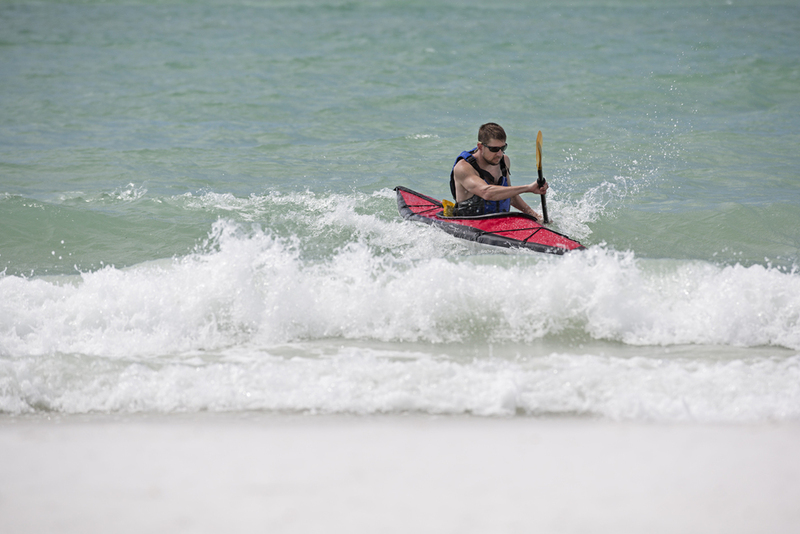 This was the only scheduled trip of our vacation in Florida, but since we had kayaks for a week, and my parents live on the water, we of course took advantage and did a lot more paddling. I was lucky enough to paddle everyday, and get some of my paddling calluses built back up for the spring season ahead. Alligator Creek Cruise with Cratty: Wednesday morning my sister-in-law (Cratty) and I went out for a 4.5 mile cruise around the canals. She paddled the Citibot, and I took out the Yukon this time. Cratty taking the Citibot out for a tour around Alligator Creek, behind my parent's place. Paddling past the homes along Alligator Creek. A restaurant on Alligator Creek, which unfortunately has a bad reputation. A less inhabited section of Alligator Creek. Citibot Goes to the Beach: We took a road trip North, to Sarasota, to enjoy some sandy beaches and waves in the Gulf of Mexico. The whole family, all 7 of us, piled into our rented minivan. Along with all the normal beach crap, we were able to sneak kayak in the trunk as well. The Citibot frame and skin, ready to be finished off. Jim waiting for some waves. Jim and I took turns paddling past the break, this little guy performs pretty well in light waves - we were even able to surf a few in to shore. Jim playing in the surf. I took it one step further and put on the skirt so I could attempt a roll. With a beam of 34", this is by far the widest boat I have ever tried to roll. It was hard enough to flip it, let alone right it, but I fought hard and completed a roll on my first attempt. Upper Reaches of Alligator Creek: On our last day in paradise, my brother and I got up early to explore more of Alligator Creek inland from the parent's house. We were dropped off with the boats where highway 40 crosses the creek. We put on and paddled up stream to a dam. At that point we had already paddled 3 miles, and decided to head back. We turned around and headed back down stream, against an incoming tide. We paddled past where we had been dropped off and continued exploring new sections of the creek. We eventually made it to the North Fork of Alligator Creek and were able to paddle with the tide all the way to my parents dock, a solid morning with 9 miles of water pushed. Jim checking into his flight for the next day as we float on Alligator Creek. She's Going to Be a Kayaker: Before we put the kayaks away one last time, Jim took Brenna - his 17 month old daughter - out on her first ride in a touring kayak. She seemed to enjoy it, and so did everyone else who was watching her from shore. This kid loves the water. Waving to the crowd assembled to watch her. Learning a proper paddle stroke. Demonstrating the safety functions of a whistle. These boats logged quite a few miles in Florida, and performed well for the whole family. We took them adventuring, leisurely paddled them in the canals and even fishing one afternoon, but didn't catch a thing - so no photos were taken. After Brenna had her fill of paddling we packed both the boats up, put them back in the boxes they arrived in, slapped a FedEx label on them and sent them back to Charleston to await their next adventures.